WHEATLAND, Mo. 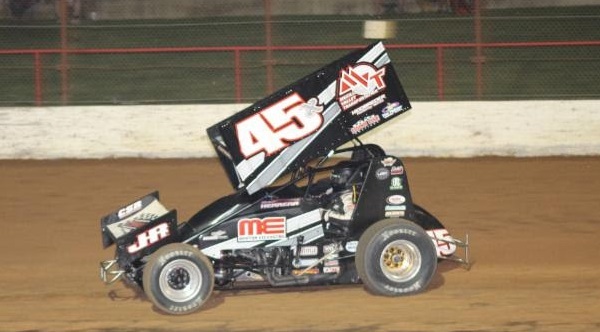 — Johnny Herrera made a late-race pass and held off veteran Sammy Swindell to prevail in the main event of Thursday’s Jesse Hockett/Daniel McMillin Memorial opener at Lucas Oil Speedway. Herrera, of Albuquerque, N.M., earned $3,000 for his fifth Lucas Oil American Sprint Car Series National Tour victory of the season as the three-night event got underway. Swindell, a 60-year-old veteran and three-time World of Outlaws Series champion, led the first 13 laps before Jonathan Cornell took the lead on lap 14 after a restart for the race’s fourth caution. A red flag flew later that lap when Josh Baughman wound up on his top after jumping the cushion out of turn four. He was not injured and, because the red came out before the lap was official, Cornell was scored behind Swindell. Swindell took advantage and went on to open up the lead on the restart, with Cornell slipping to third behind Herrera. Herrera tightened the margin and was pressuring Swindell when the sixth caution flew on lap 21. He quickly drove around Swindell on the high side to take his first lead of the race on lap 22 — but another red flag, when Blake Hahn wound up on his side — halted things with three laps remaining. Herrera ultimately pulled away after the final restart to earn the victory. Swindell said he had some brake issues late in the race and had to fight to hang on for second. John Carney wound up third, Brad Loyet was fourth and Cornell completed the top five. A scary situation occurred on lap seven of the night’s third B-Main, when Ray Allen Kulhanek had his car catch fire going down the back straightaway while leading the race. He spun the car to a stop against the wall near turn four, climbed from the cockpit and rolled — with his driver’s suit ablaze — until fire and safety crews arrived.